We may like the beginning where things are new and exciting and we write down all our idea’s, putting things into order and get ready to go BUT often if things put you off starting then you may not start at all. Some of us like the middle bit where the first scary bit has been scaled and we settle into the routine of the ‘plan’ at hand and it often makes us feel safe but it can often halt our progress. Others like to rush to the end without often really taking enough time over the middle bit where it matters most . These people do finish the task but sometimes procrastinate about another start.So, figuring out which one you are is very helpful as you can then be aware of what you normally do when starting a new thing. From there you can work well in the knowledge that you need to enjoy all three parts of a PLAN. Another thing we often do is make a big thing about getting or having a plan. We often put a date when we want to start or end which puts pressure on us before even begin, this is why New Years resolutions are often marked for failure, especially if you want to do something outside like horsemanship or getting fit, as the weather can be against us and if we’re one of the people that has difficulty starting something then our plan has stopped before it’s begun and that can be the end of our enthusiasm and the plan altogether. SO…how can we help our plans GO to plan? Firstly we need to be very realistic about what we want such as I want to feel fitter because it will be good for me and my horse OR I want to help my horse find relaxation in our training so that it’s more fun for us both. Usually if we try something like ‘I want to loose 3 stone before Easter’ and it’s only just past Xmas or ‘I want to ride a 50k endurance ride’ without any smaller plans to get there, is not setting yourself up for success. Remember too that it’s not just about physical success or failure it’s about mental and emotional success or failure. If you take care of your mental state and make tasks achievable then your happiness at doing that will help push you on to your goal. I could change each week the gait or distance I do but it gives me a place to back down to or a place to advance without making me feel I’ve not achieved anything. I find if I don’t give myself these ‘permissions’ I often don’t do anything at all and that can become stuck before I’ve begun. Also adjust your plan weekly to make sure you’re working to a plan you can follow but also make sure that it progresses. I also try not to give myself a date to start or finish or do things like weigh myself for me getting fit as it’s about enjoying the journey, finding my own pace and loving the fresh air and scenery. When I feel fit in myself then to me I’m fit. It’s the same with my horsemanship. I know when I’m working better because I don’t have to think about what I’m doing, I don’t get out of breath, I don’t run out of ideas and I don’t realise how much time I’ve been playing until after the session which went well because there were no time restraints on what I was doing. 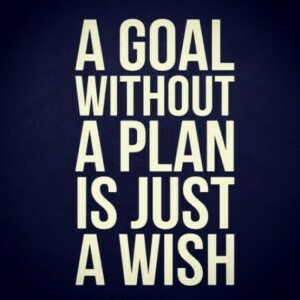 Having a plan is great but make that plan DO-ABLE for yourself. Don’t worry about what others are doing but ask for help from a good source if you need it, don’t be afraid to ask for help and keep progressing if that’s what your goal is. Also don’t over do things and put yourself off doing more or even strain yourself if exercising so that your plan has to be put on hold. If anything happens always make sure you get around to re-starting your plan, don’t just let life get in the way, make time for yourself. Remember that ‘Practice Makes PROGRESS’ and if your plan is good for you and you adapt as you go then you’ll soon find your goal is achievable. We are all asymmetric, and so are our horses. To help us both become straighter we need to be flexible on both sides of our bodies. 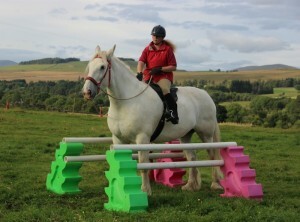 We often spend quite a lot of time building straightness in our horses with exercises, through ground work and then ridden, such as circles of all sizes, leg yields, shoulder-in and haunches in, these and other exercises help to progress a horse to where their muscles on left and right are working equally. With this in mind we also need to WORK ON OURSELVES for straightness. We are either left or right handed. This means that our left or right sides are more dominant than the other, which is normal. 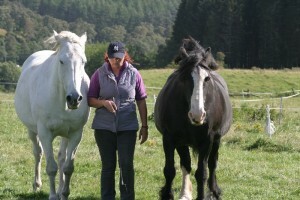 What we need to do is become more ambidextrous to match the work we’re doing with our horses. This in time will allow us to be able to ride a straight line in harmony with our horses WITHOUT picking up the reins and I often test this theory to see how harmonious I am becoming with my horse. I also see an osteopath regularly to help straighten out any stiff points on my body that can’t be fixed by regular exercises. that you don’t over do your harder side. Holding your coffee/tea cup in OH. Using your knife and fork in OH’s. Folding your arms the ‘other way’. Crossing your legs the ‘other way’ and change sides if you’re curled up on the sofa. Writing…can be fun and really uses the ‘other side’ of your brain a LOT. Using the mouse or touch pad on your computer with your OH. Vacuuming….this one is great, there are 4 ways of helping your whole body become more symmetrical with this. 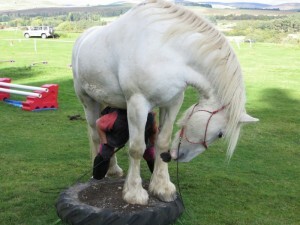 Putting on horses rugs and saddle from other side using whole body differently. Turning pages on a book with OH. Leading your horse (or walking your dog on lead) from other side. Putting washing up on line using OH to do the pegs. Walking down the road doing little canter ‘skip’ gait, changing canter leads and really feeling if your head, shoulders and hips are aligned for canter is a great way of getting this smoother before trying on your horse. Ironing can be done with your OH but be careful with this one! Putting shopping into basket and also putting them away at home can be done with your OH. Putting your OH and arm into your jacket first! I’m sure you can think of lots of other tasks that can be tried out using your OH, it really does more than just use your OH, it uses your whole body and your brain to think about and do them well. Make sure you build up your OH strength slowly, do a bit of something then go back to normal, then do more each day as your OH AND YOUR BRAIN get used to doing it. Bring in another OH X when you feel good with the first one and build up more as you go to keep it progressing. Make sure, like with horses, you do not over do it or you could become sore in muscles that aren’t used to being worked, and that will put you off doing more. Do you get butterflies in your stomach when working or riding your horse? Do they make you emotional? Do they upset your horse? Do you feel you can’t control their fluttering? If so then maybe these technique can help ‘get your butterflies in formation’ so that you can use that energy and focus positively instead of them distracting you and making you feel overwhelmed. 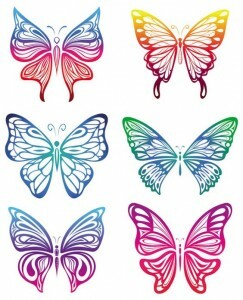 What I try to do is visualise the ‘feeling’ of ‘butterflies’ in my stomach. 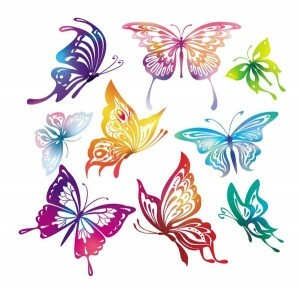 To me they are seen as real butterflies with glorious colours all fluttering. When there are many of them due to high anxiety, energy or excitement then I try to make them useful to me and to have ‘control’ over them. To control them I ‘synchronise them and put them into ‘formation’. I bring all of them down to just 6 butterflies visualised under my ribs towards my belly button in a 2 across, 3 down formation. Synchronising them means they start to all flutter with the same wing flaps and rhythm, this helps me control my energy and getting them into formation helps me create a focus of where to take that energy…this is then picked up by the horse and we start to become more harmonious because I am being more focused. To help bring the energy down in me, or my horse, I try to visualise those 6 butterflies flapping less and less and when it feels right I go from ‘seeing’ 6 butterflies to just 4. 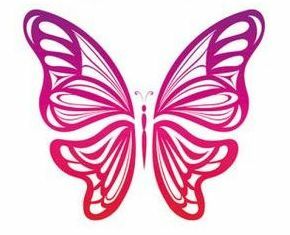 As my energy, breathing and butterflies become more controlled I visualise just 2 butterflies becoming calmer and more synchronised. 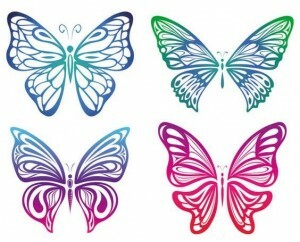 Finally when everything is calm I see just one butterfly, representing a peaceful state. When that one is completely still it is in what I call ‘neutral’ and represents where the horse and I are usually connected standing still. 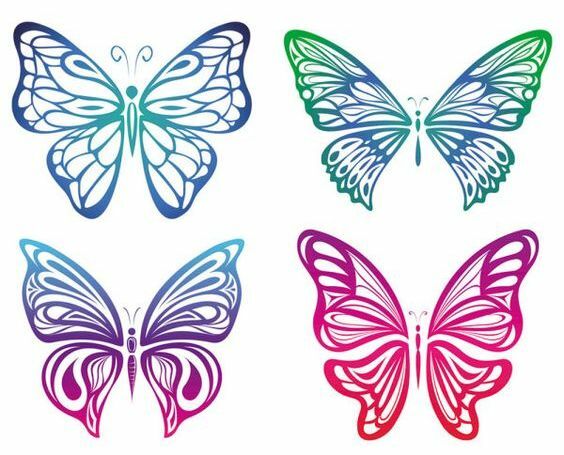 The single butterfly can flap low or high and it represents controlled connection and can build up to 2, 4 or 6 butterflies again in a controlled manner to help find the inner energy for upward and downward transitions. With this visual and with breathing techniques our horses can find us more harmonious to be with . Intent, to me, is the thought and feel behind a request. 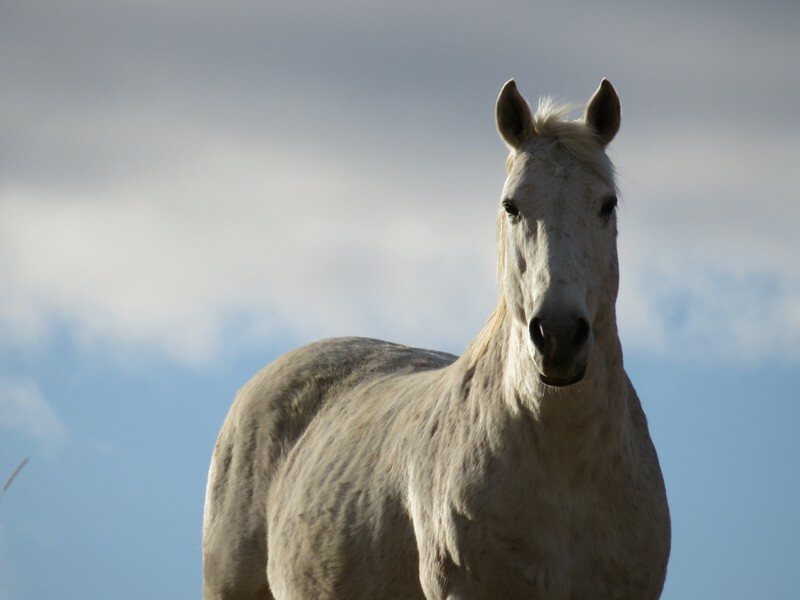 We need to think about whether we’re asking in a dominant way (move NOW…), or a request (let’s move together…), or is it a plead (please, please move but please don’t leave me…) Trying to be an Alpha to our horses means that we need to request. There are many types of intentions behind our requests too, such as love, fear, nerves. Horses are very good at reading our intentions whether they are good or bad but also if we are calm and confident or nervous and fearful. So, how should we use our intent around horses? Also if we plead then we are not being an alpha and the horse will be required to step up to do that job herself/himself. If we hold onto thoughts of love, calmness and confidence then the horse will show calmness and confidence with us. What often happens though is that our mental intent or thoughts try to be calm, confident and full of love but are incongruent or conflicted with our energy and body language which may show fear and uncertainty. The horse can read this immediately and feels unsafe around us. We must work on having our inside and outside intent the same so that the horse sees, feels and reads us and we don’t confuse them. Horses don’t have this incongruent behaviour, it’s a very human, predatory thing to do. 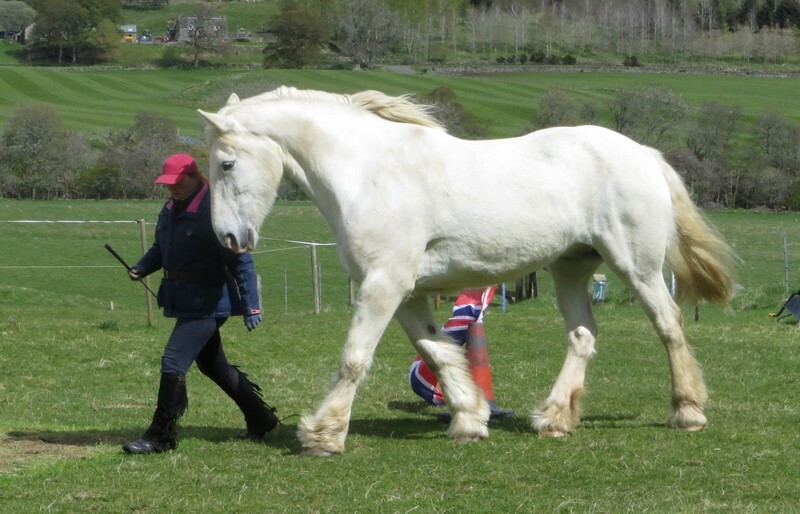 If we learn to think more of our herd requests as a ‘we’ connection, ‘we are backing up’, ‘ we are moving into canter’ then put some energy out and take the space under the horses feet either with a tool such as a training arm and string, swinging a rope or actually going to the spot and taking the space the horse is standing on then the requests start talking about ‘space’ and how to shape it the way we want our horses to be. 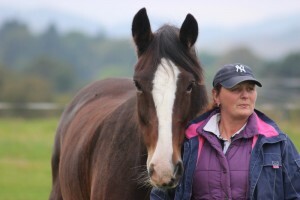 SO, if we start to ‘mirror our horses’, use ‘awareness and focus’, play with the game of ‘stick 2 me’, remember to request things using ‘alpha phases’ from ‘herd dynamics’ we can ‘shape the space’ between us and our horses with confident and positive ‘intent’ to create harmonious connections and ‘invisible horsemanship’ that is so refined, light, soft and balanced that we have the dance partner we always wanted. We go introverted and many other reasons. Horses are very aware of breathing and if we hold our breath for any reason the horse feels this, our body changes from soft to slightly stiff. Holding our breath could be interpreted by a horse as us going introverted, thereby they need to start leading, it could be interpreted also as us in a freeze moment before flight and the horse goes on edge ready to flee with us, whatever the reason holding our breath isn’t good. Irregular breathing isn’t good either as it doesn’t ‘flow’ well or give harmony to our movements. What we need to do when around our horses is to remember to breathe, it helps to relax us and our horses and we can start using our breathing as a cue to what we want. 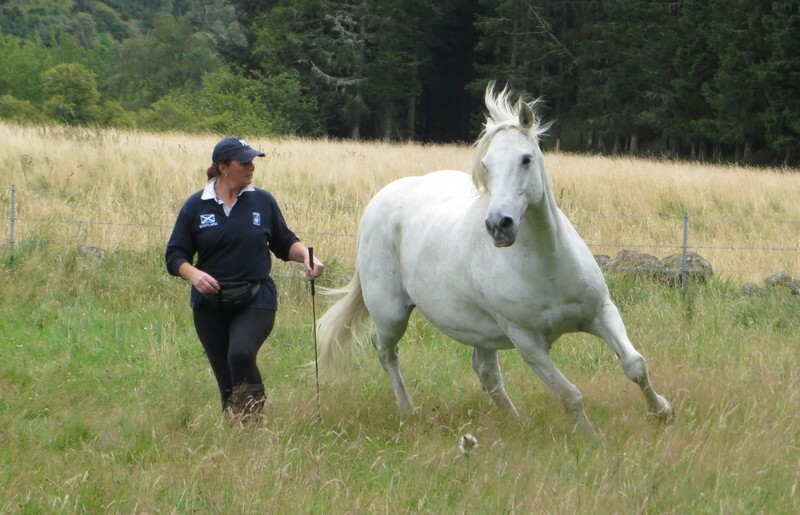 To help us do this there is an exercise we can start doing on the ground that will help us to remember to breathe, start doing this as soon as you are confident and comfortable leading your horse around with the Stick 2 Me principle (see S2M article). 1) You at horses neck (or further back as your progress your Stick 2 Me exercise), horse working in a nice confident, rhythmic walk with you. 2) Get in time with your horses front feet, left to left, right to right. 3) Start counting footfalls, 1,2,3,4….1,2,3,4…..1,2,3,4. 4) Breathe in for the count of 4. Breathe out for the count of 4. Once you start getting a good breath routine of 4 in, 4 out then start trying to relax your lungs and stomach and getting more breaths in/out without changing the rhythm of your footfalls. You will hopefully find that you can count to 5 in, 5 out very quickly, then 6 in, 6 out and onwards. See how far you can count BUT don’t forget to play Stick 2 Me with your horse and walk lots of patterns to keep him/her interested. Don’t become TOO focused on your breathing and forget other things. 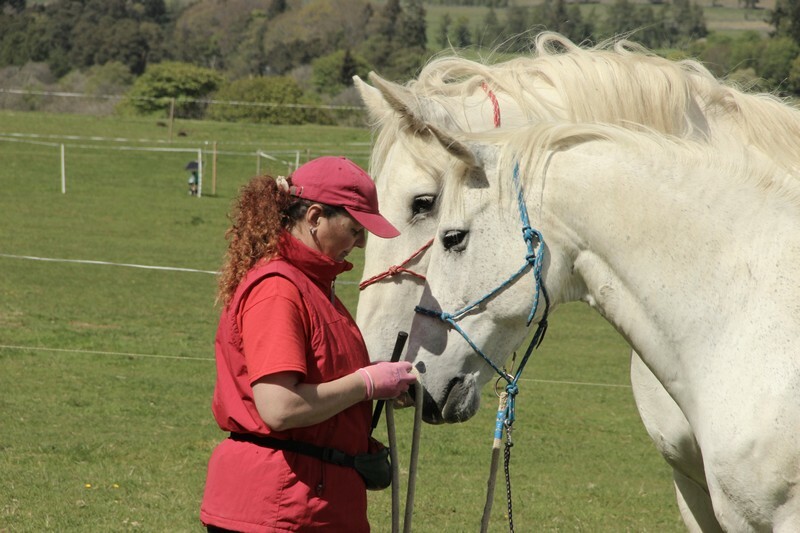 It may be good to start practising counting breaths whilst just walking without your horse, maybe while walking your dog or walking down the road. If you find you are forgetting to breathe a lot then maybe sing or whistle as you have to breath regularly to do these. Start teaching stop/start cues with breathing. From halt to walk breathe in and bring your lungs/chest upwards and forwards for a walk on cue. Big Breathe out (make a noise like blowing out birthday candles) and bring your lungs/chest down for a halt. Once you have the stop/start cues then you can start refining this to where you can breathe out slightly and continue breathing at that level for a transition down without a stop. Each horse/human finds their own levels of breathing in/out that they respond to so you must practice and find what works for your horse and you to become more in harmony. Just remember breathe out for slower/stopa nd breathe in for walk/trot/canter on. Also remember to breathe and count steps when riding, this can really help you and your horse to relax, especially when doing lateral moves or a dressage test and if you are doing a jumping course you will find you and your horse relax if you can teach yourself to remember to breathe OUT when going over the jump. Stick 2 Me is where a horse and human connect through thought, energy and body cues in a synchronise ‘dance’. I use this ‘dance’ more than any other as it brings together ‘Mirroring’ and ‘Awareness & Focus’ (see previous articles on these). I start S2M with halt/walk transitions online, then I add backup, then I add trot and often then go to a neck rope and then liberty. I then add canter but only when there is a real connection to the transitions. 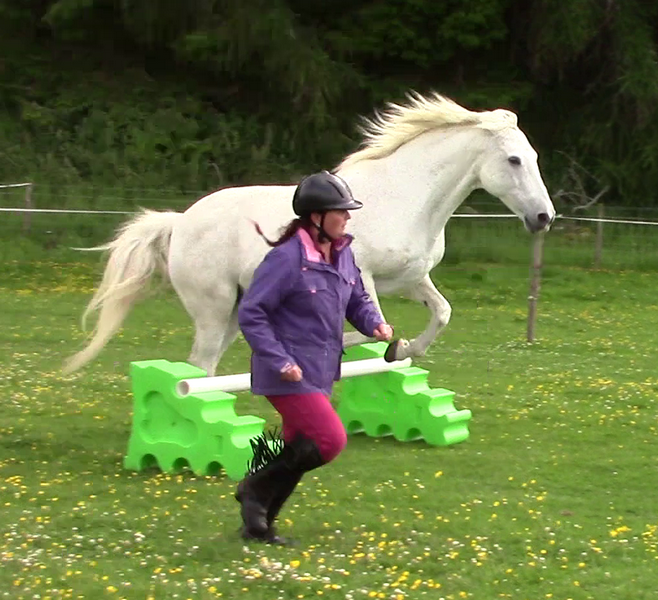 I take slow steps and never progress onwards until the lower gaits are in place well. S2M is also how I like to lead a horse. 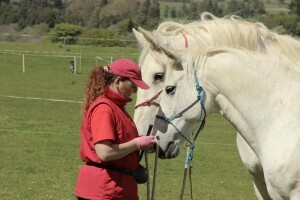 1) I hold the lead rope in my outer hand, standing by my horses head/neck with my inner hand on the horses shoulder. 2) I breathe in and think ‘walk on’ in an ‘up and forward’ body cue. 3) I count two (or more if a slower thinking horse) before moving off, then breathe normally. 4) If the horse does not follow then I try the steps above again and then tap on the horses shoulder with my inside hand as a cue to move forward. If tapping the horse doesn’t work then I put the lead rope in my inside hand and create some impulsion by swinging the end of the lead rope towards the horses rump. Soon the horse will be listening to my breathing cues to walk on and the tap is not necessary. 5) I try to make sure our footfalls are the same, left with left, right with right so that we are more harmonious. 6) When going up a gait I again breathe in with the thought in my mind of ‘up and forwards’ into that gait, then I wait two seconds before doing that gait in my body. My aim is to be able to simulate the gait I want in my focus and core without having to physically trot/canter myself. 7) When going down a gait I breathe out loudly so that my horse can hear me, this lowers my inner energy for a halt or backup. 8) When going down a gait but not stopping I make sure my breath out is only to the level of gait I want, this takes a while to get right and testing your breath out and breath in and seeing the results your horse gives you is the guide to how much you need to do. Remember that a BIG noisy breath out should be halt and by refining your core breathing you will find those subtle gait changes as you go along. Once I have a good connection with a horse the techniques of stick 2 me can become quickly refined and will start to look like you are using invisible cues. But to do it well you need a lot of practice to really get into our horses hooves through our thoughts, energy levels and body language. When starting to play with stick 2 me I often follow the horse in a mirroring style, this helps the horse relax and start to notice me more. Then whilst I’m following him I will put in some of my own moves to see if he will follow me. The horse, being a curious animal by nature when confident and safe, will start to notice that and I continue this exchange of ideas between us until after a while we are following each other and often you can’t tell who is following who, we’re just together. I start Stick 2 me by standing next to the horses head or neck, then I work from the shoulders, later on I work near the hip and then I see if I can lead from behind the horse with him out in front of me. I also make sure I work on both the left and right sides equally to help with my relaxation and flexibility principles. Mental focus is basically our thoughts. Good mental focus involves taking a plan and breaking it down into smaller steps, visualizing those individual steps so that our bodies follow that picture and building it all up to have the plan in action. Body focus is knowing about and using body language. Knowing the way our body moves, with energy and purpose. What you need to be aware of when around your horse are things like where your body is in relation to his, is he pushing into your personal space, is the environment safe, where are other horses in the field and how are they behaving! All these things take awareness and if your horse sees and feels your awareness and confidence then he can be confident that you’re looking after the situation. With awareness and focus we learn to know how the horse moves and where the horse is likely to move to. They understand body language very well so it is us that needs to learn how to use ours better to help us become in better harmony with them. Once we’ve learned about awareness and focus they become second nature. It’s like driving a car, when you start you have a lot to think about such as checking the mirrors, changing gears, which foot for acceleration or braking and indicating left and right, and also where all the other car users are. Also all the smaller things such as keeping windows clear for vision, checking the petrol and oil, making sure the engine is running smoothly and many other jobs. It seems overwhelming to start with but soon we do it all instinctively, and this is what learning invisible horsemanship is like too. Once we learn how to be aware and to use our focus well it all becomes second nature. To have a horse confident in us because we’re aware of everything and so focused we don’t get side tracked is the mark of someone our horse is happy to follow.